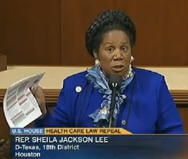 Although the House recently voted 245-189 for HR 2, 'Repealing the Job-Killing Health Care Law,' it is still humorous to watch Sheila Jackson Lee's (CD-18) attempt to prove that the health care reform bill itself wasn't unconstitutional, but rather the act of repealing the health care bill is unconstitutional. Texas, a big state, has already said, through a governmental agency, 'We need this bill, and we hope that those who come from our state and many other states will not vote against the protection of patients. Vote against HR 2, and provide yourself with the protection of the Constitution. So repealing the health care bill is unconstitutional because people will die otherwise? And the majority of Texans absolutely do NOT want health care reform! What is she thinking?